There’s nothing like discovering hidden treasures in a neighborhood you thought you knew – or savoring a certain delicacy you’ve never had – to get the conversation flowing. And that’s exactly what happened during the VACEOs Richmond Real Food Tour – part of the Council’s Limited Access series of events. Limited Access event attendees have discovered what it takes to manage a minor league baseball team, be a local beer brewer, and compete on a curling rink. 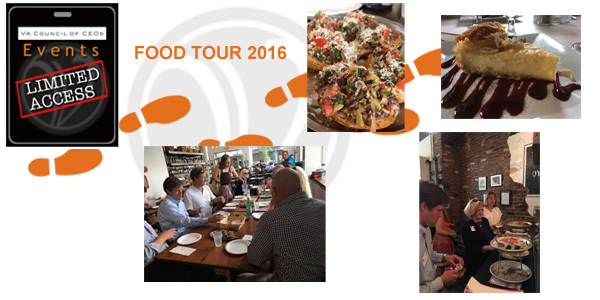 Uncovering local culinary gems in Richmond’s Monroe and Jackson wards was on the agenda for this most recent event. Hosted by Maureen Egan, writer, “RHome” columnist and co-owner of Real Richmond Food Tours, the tour began at Maple & Pine inside the trendy new Quirk Hotel. Other stops included Mama J’s, Pop’s Market on Grace, Greenleaf’s Pool Room, Chez Foushee and Rapp Session (Rappahannock River Oysters). The group sampled a wide variety of dishes, including swordfish, catfish, collard greens, quail bruschetta, oysters, and amazing treats like the infamous Fat Elvis Ice Cream Sandwich from Greenleaf’s and Chez Foushee’s lemon butter cake, to name a few. Along the way, VACEOs members learned about the historic neighborhoods, discovered hidden murals decorating forgotten alleyways, got a lesson on how to hit a cue ball just right, and, most importantly, got a chance to find out more about each other and share business experiences. Get to know your fellow VACEOs members and ease into a conversation that could change your business. Visit the VACEOS Events page and register for an upcoming event today!